Two of the seven classic sauces that accompany bollito misto alla piemontese. Tomatoey Bagnèt ross (or rus) is made with garlic, tomatoes, onions, carrots, olive oil, red wine vinegar and chilli pepper. 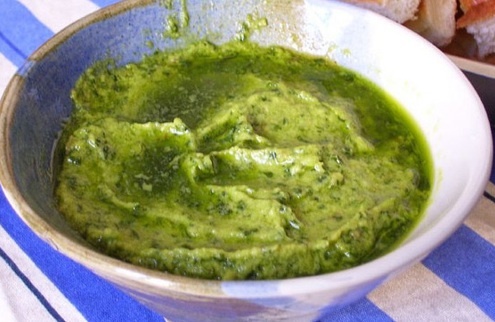 Bagnèt vert is similar to salsa verde, made with parsley, anchovies, capers, pickles, red wine vinegar, and olive oil, thickened with bread.